Happy weekend everyone! 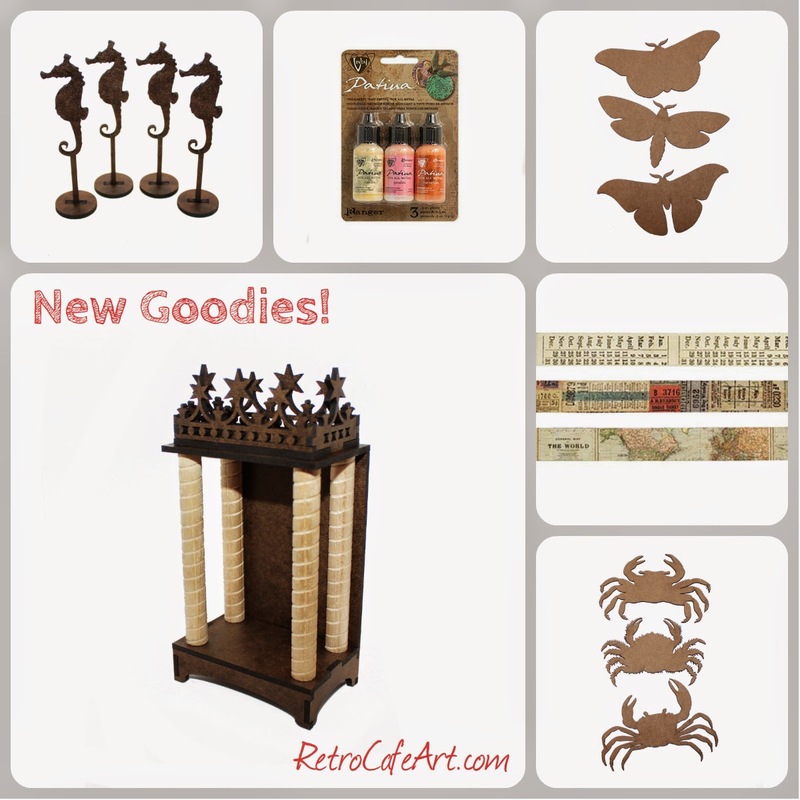 We have lots of cool new goodies in the shop this week! 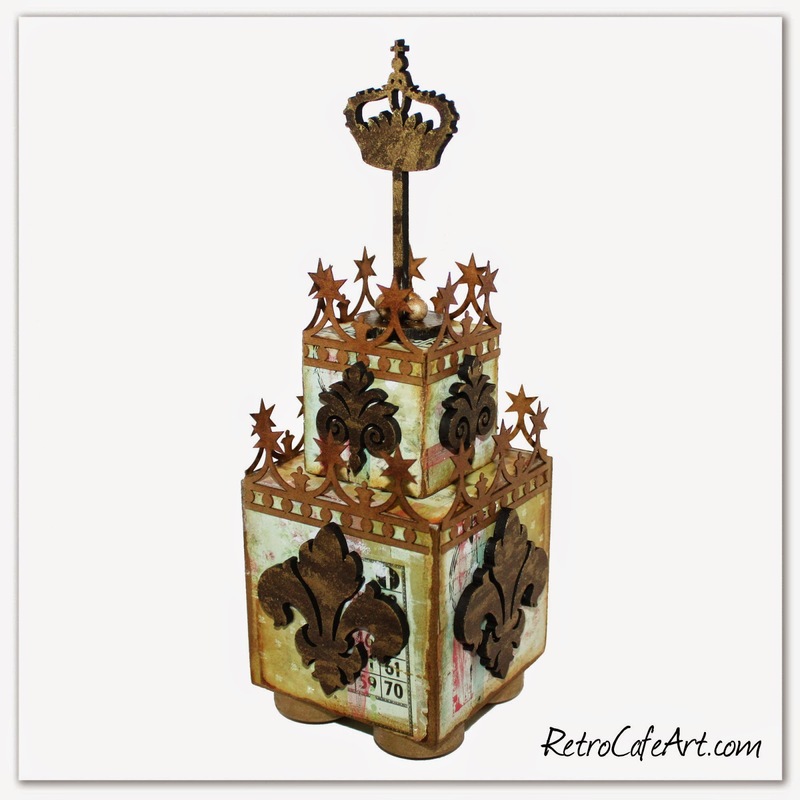 Fabulous Chipboard Shapes, New Tim Holtz, and of course my favorite, the Regal Altar Shrine! This shrine has been swirling around in my brain for a while, and I'm so pleased with the way it turned out. It's one of my favorites to date! It's very unique and will be amazing for displaying found objects. Of course mine will likely display an antique doll or some doll parts! I was also thinking the new Chipboard Shapes, especially the fish and crabs, would make a FUN summer garland banner. Just punch a few holes with a hand held hole punch and voila! 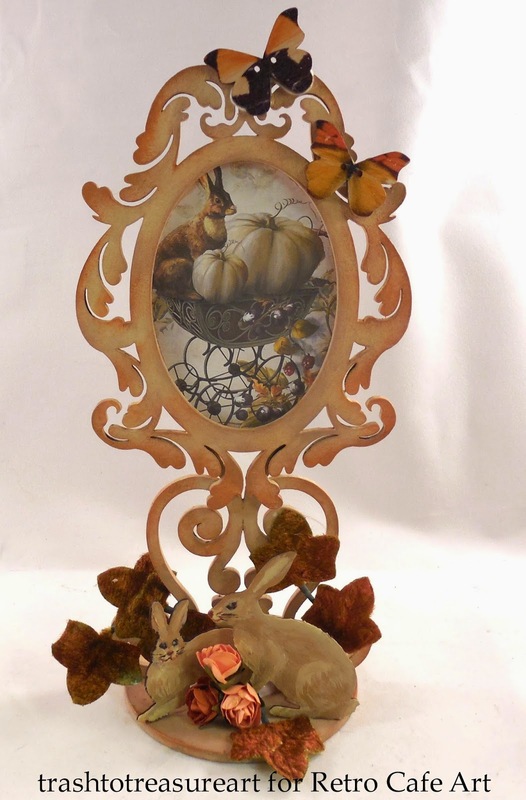 A stunning Easter and Spring inspired Ornate Frame by Design Team Member Lynn Stevens! Loving those painted bunnies Lynn! This would be so sweet as an Easter table decoration. 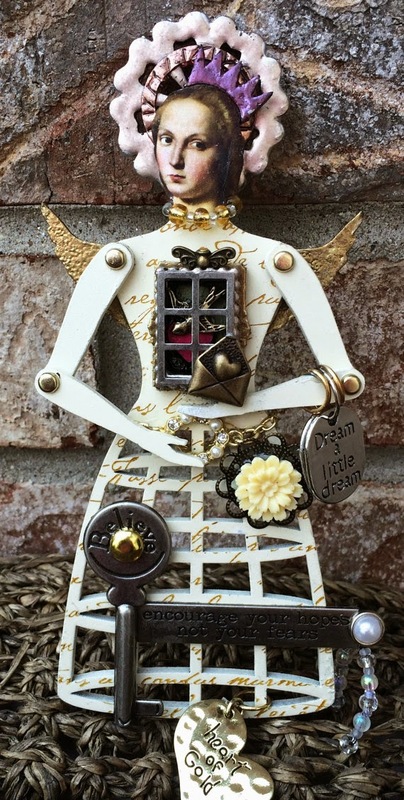 A gorgeous, heartfelt Dollie journal page by Design Team Member Amy Nieman! How sweet is the bird's nest dress! The colors are just gorgeous Amy! 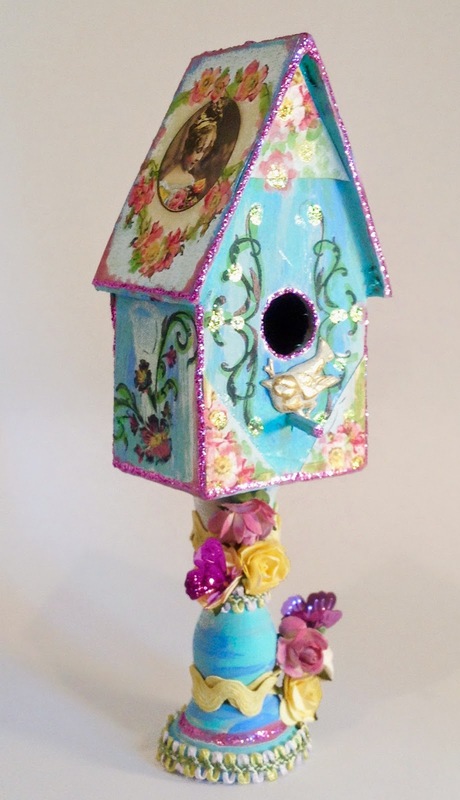 It's feeling a little more like Spring with this gorgeous birdhouse by Design Team Member Gerri Herbst! 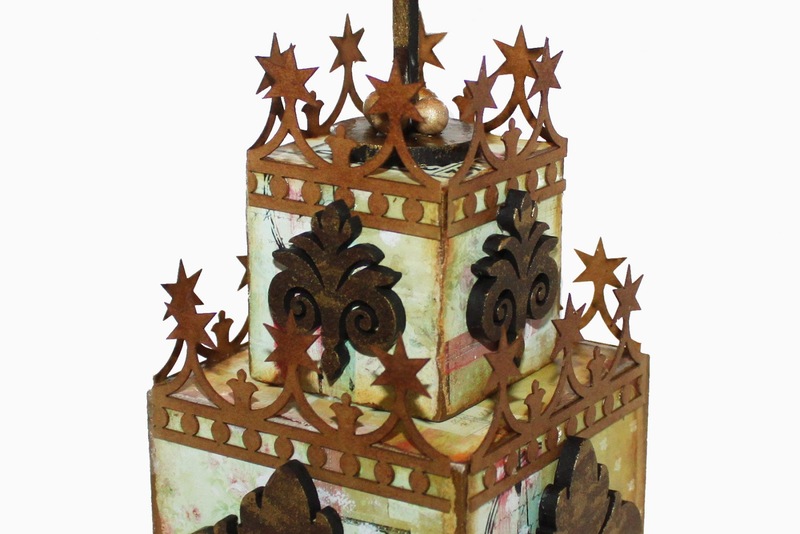 The Candle Stick base is just perfect. Such a bright, happy piece Gerri! 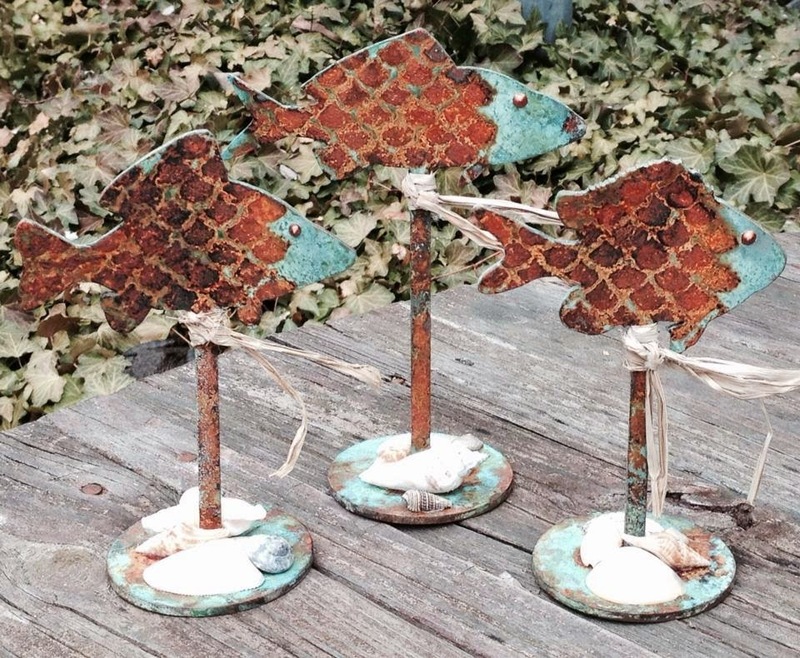 Fabulous Fish Sticks from a sunken shipwreck by Tracy Delisle! They are amazing Tracy. I can smell the salt water! 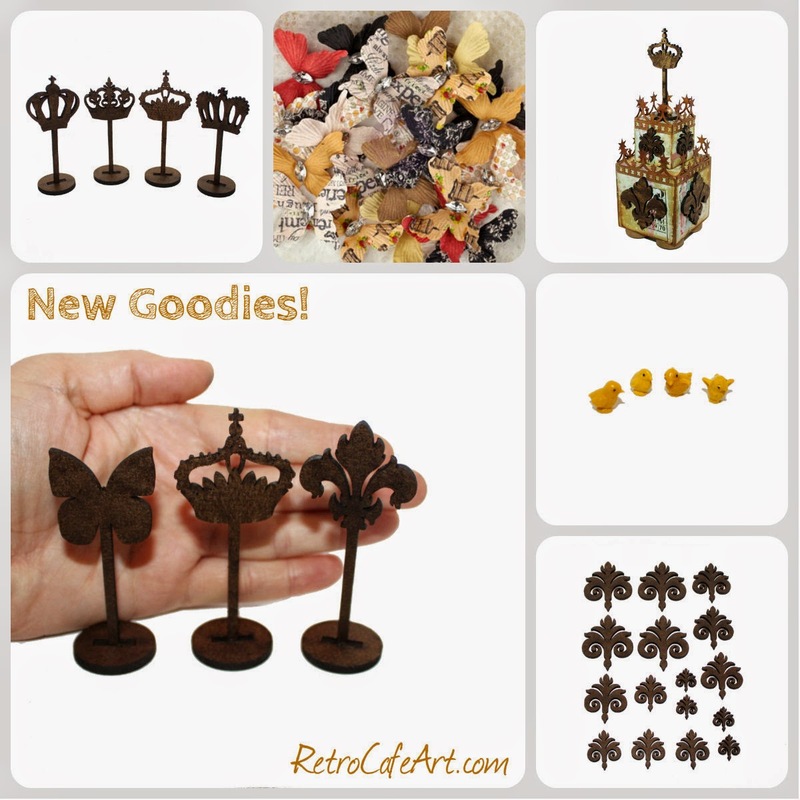 These may give you some ideas for playing with the brand new Chipboard Fish. The Tutorial section has been update! 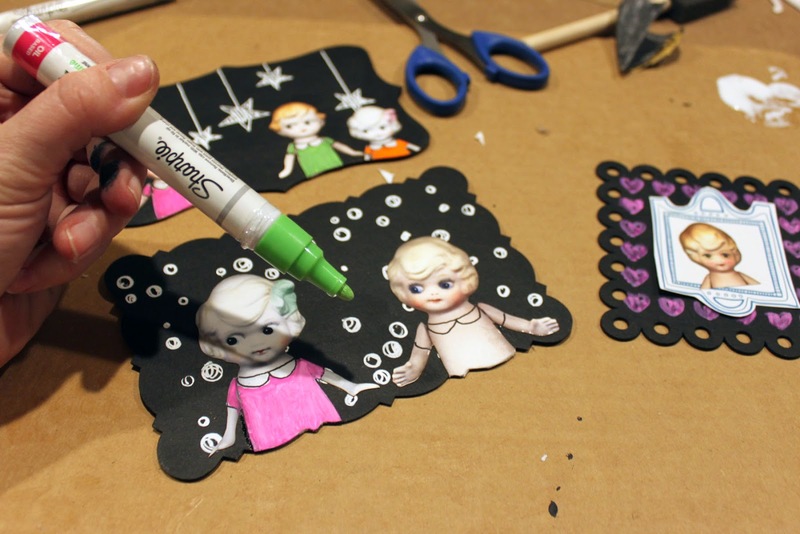 There are so many fun projects with complete step-outs. Check it out HERE. Happy weekend everyone! 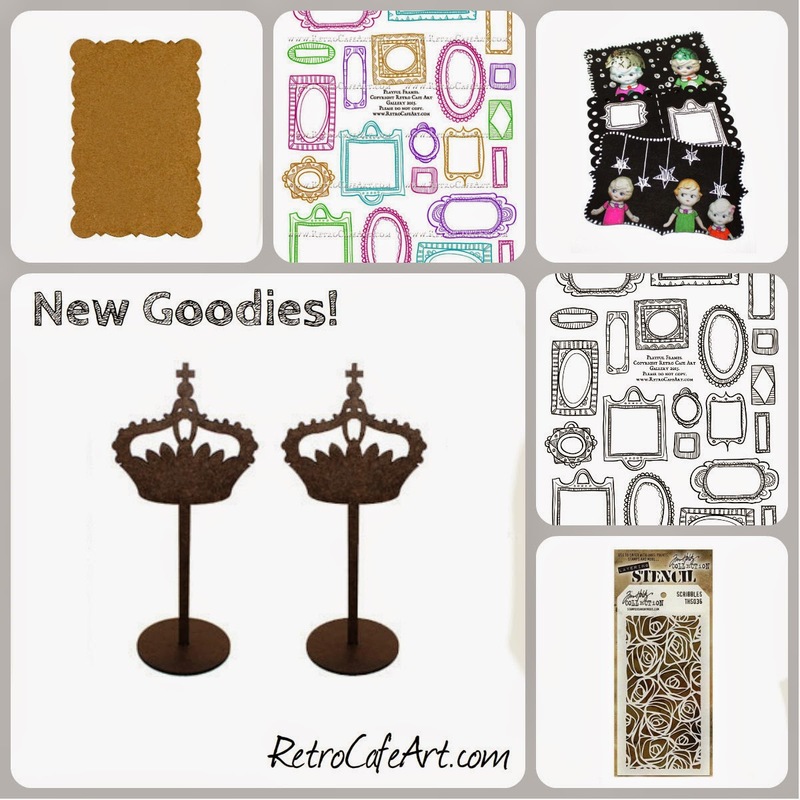 We have tons of fun new goodies in the shop this week! First, we have several new Stick Stand Ups! The Design Team has been creating some amazing things with them, so I had to add a few more! And a few of the minis from last week, are now not so mini! Second, we have TONS of new Chipboard Postcards! 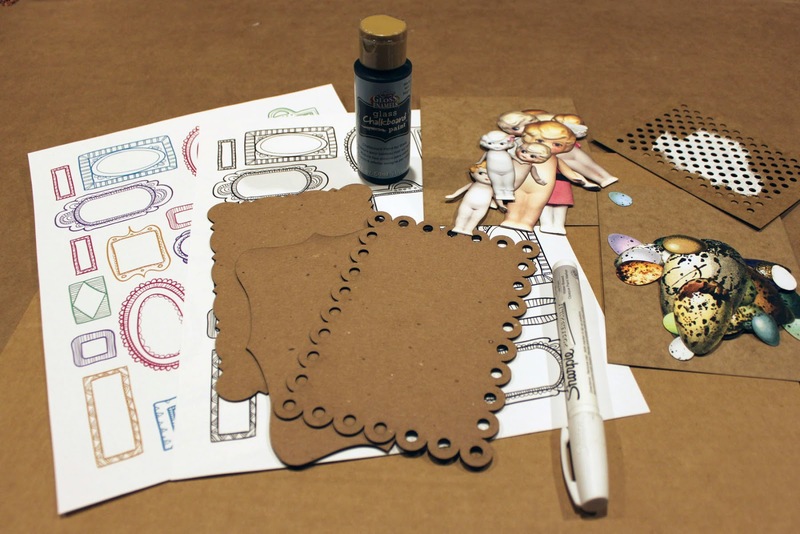 Mail art is tons of fun, and I wanted to offer some fancy shapes for you to play with. 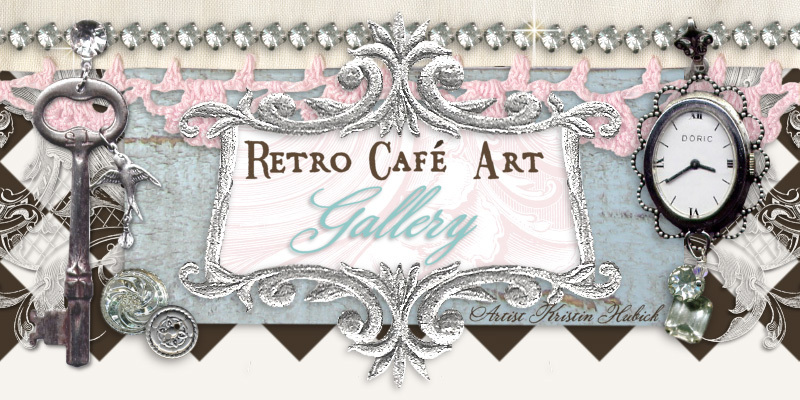 They are still 4" x 6", which is standard postcard size, but more ornate because that is the Retro way! This week's project was so much fun! And a bit different since I usually work in 3D! To be honest, these are the first postcards I've ever created, and now I'm super excited to mail them out! I definitely see more in my future! 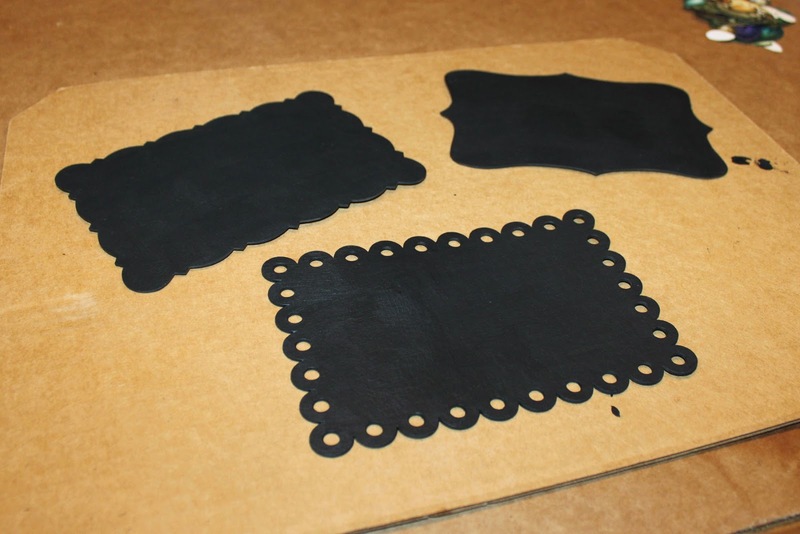 I love the fun chalkboard look of these! I hope they make the postman (or woman) smile too! I started by laying out my supplies. For the most part I had things planned out. 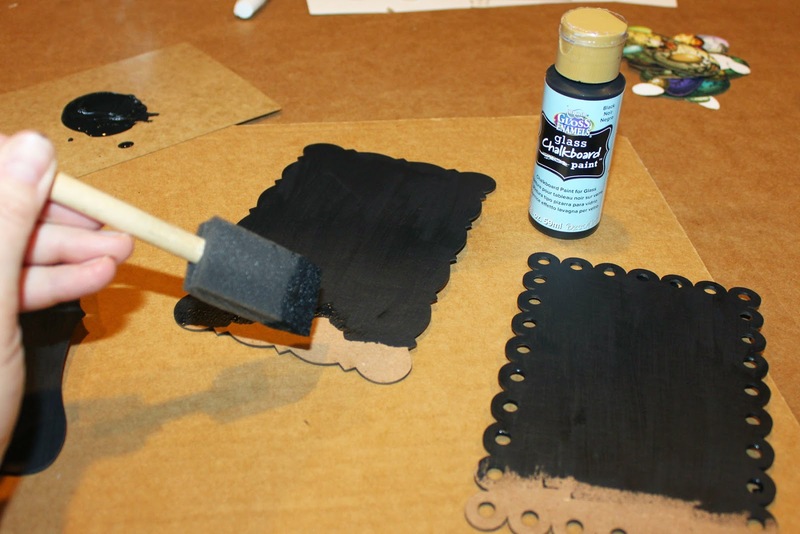 Next, I coated both sides of my chipboard with Glass Chalkboard Paint. Glass paint? Why yes! This was an accidental discovery, but this paint works beautifully on our chipboard and our Masonite. It goes on with only one coat required! Painting both sides will eliminate any possible warping! 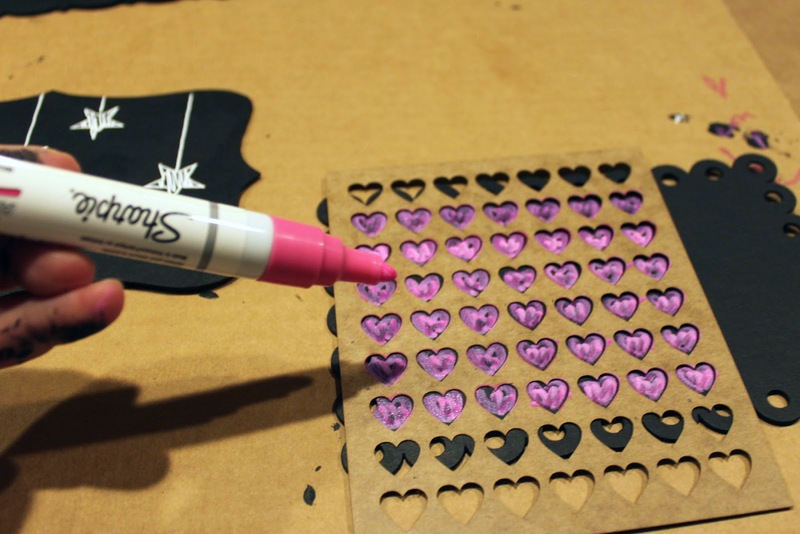 Once my Chalkboard Paint was dry, I doodled using some stencils. The Colored Sharpies were really fun against the black paint. Next I just layered on some collage elements. 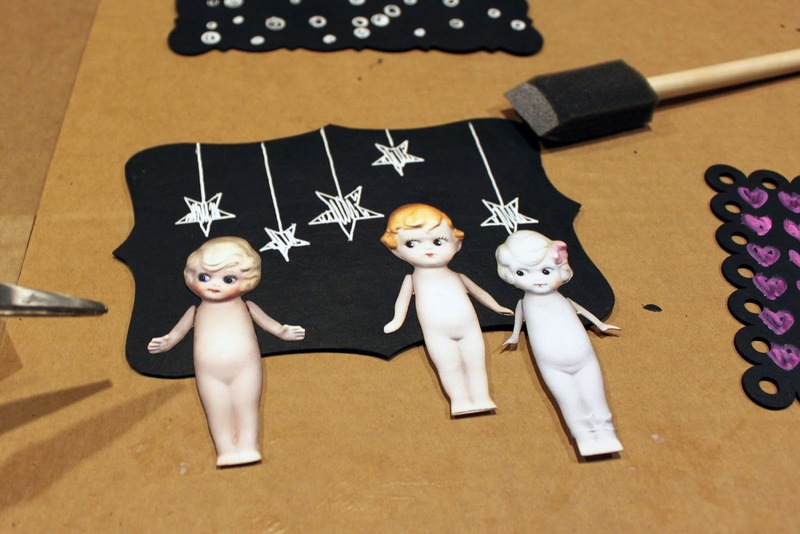 I drew and painted some sweet dresses on the dolls! I'm totally in love with the new Playful Frames Collage Sheets, AND if you get them in Sticker Paper, you can just stick on your elements! I kept the "back" of the postcards simple. Using a ruler and my white sharpie I added a dotted line in the center. Then I stuck on Playful Frames for my "To" and "From" sections (Sticker Paper option of course). I left some room under the return address section for writing a message. And they are ready to go! I had a blast making these postcards! Of course you can make them any style you wish. 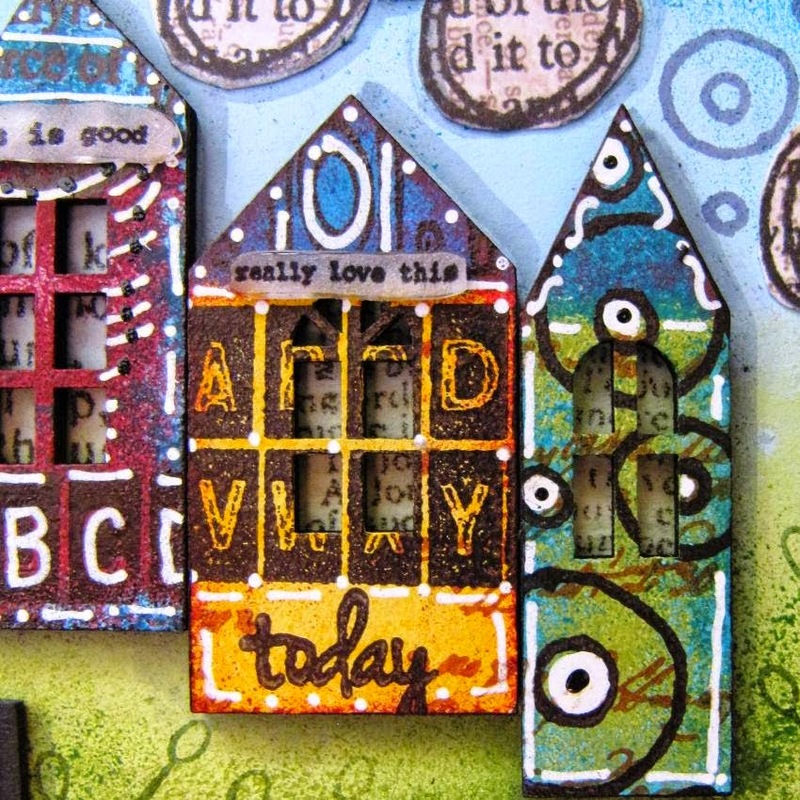 If you are new to postcards, just think of them as bigger ATCs or tags. Super easy! 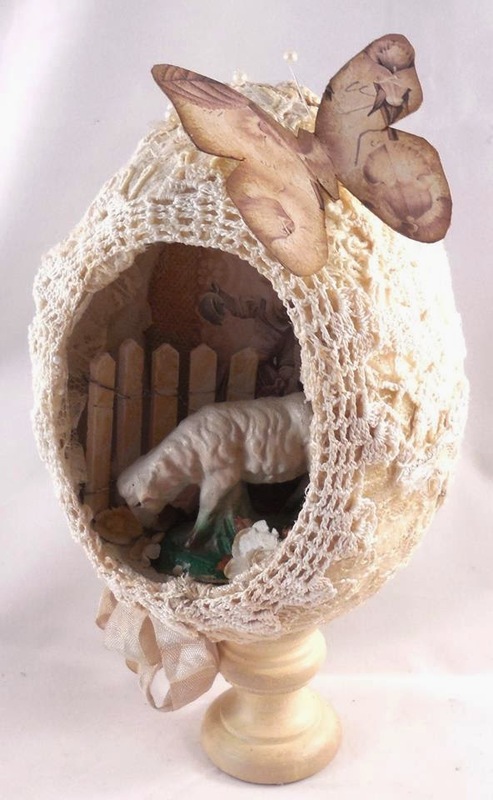 A beautiful Easter egg diorama by Design Team Member Lynn Stevens! Just loving all the gorgeous vintage lace! And she even made the egg herself! 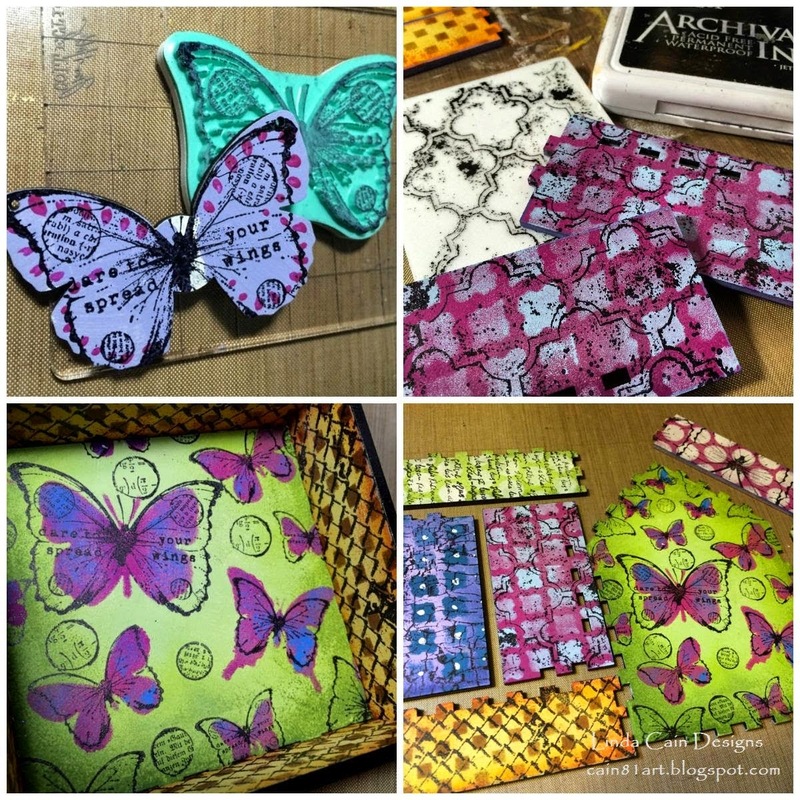 Such a lovely project Lynn! It's slightly hard to see, but the Antique Ephemera Vintage Easter Collage Sheet made for a great background. 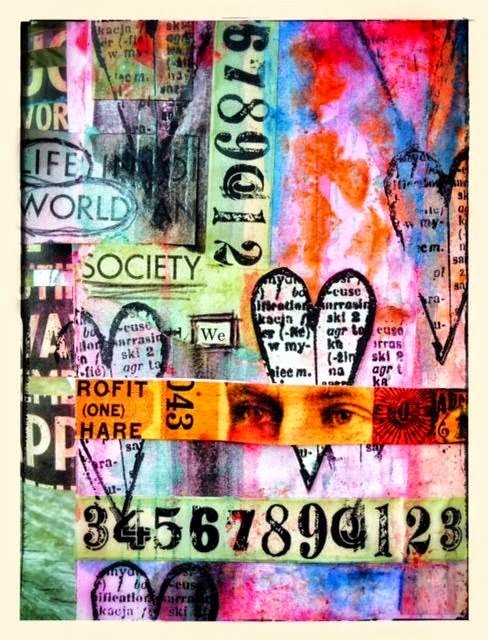 An absolutely gorgeous journal page by Design Team Member Amy Nieman! This would make a fabulous postcard as well! The colors just pop! 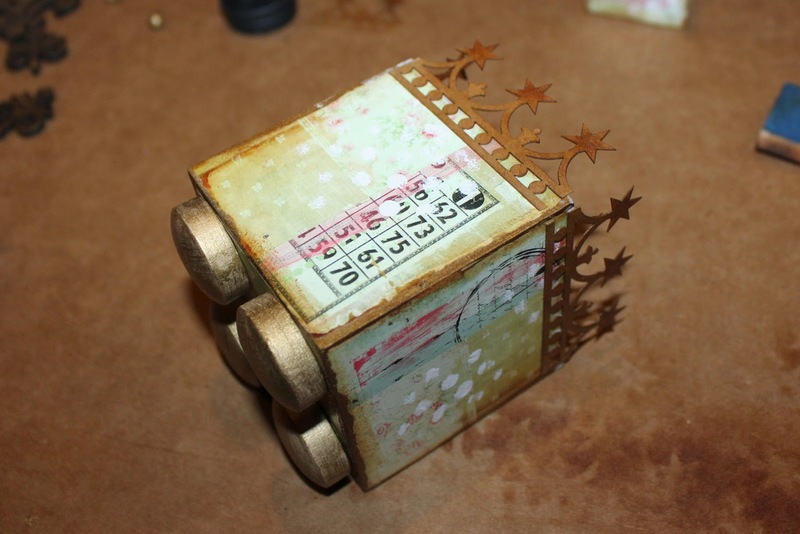 I love how she used the Finnabair Now is the Right Time Cling Mount Stamp Set! She Also Used Our Gelatos. Beautiful Amy! 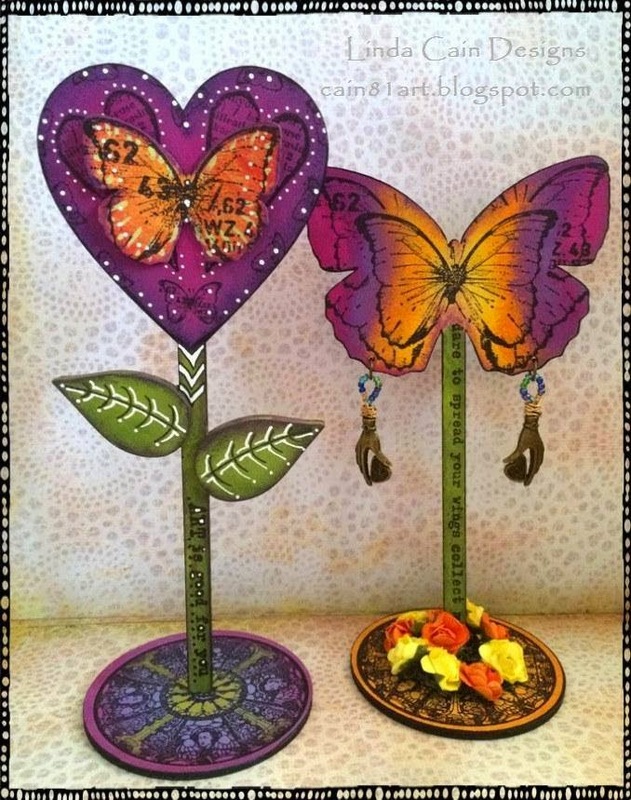 Spring is in the air, and Design Team Member Linda Cain has a bright and cheery project for you using our Butterfly and Heart Flower Stick Stand Ups! Find more stunning photos, full product links, and step-outs on Linda's Blog! 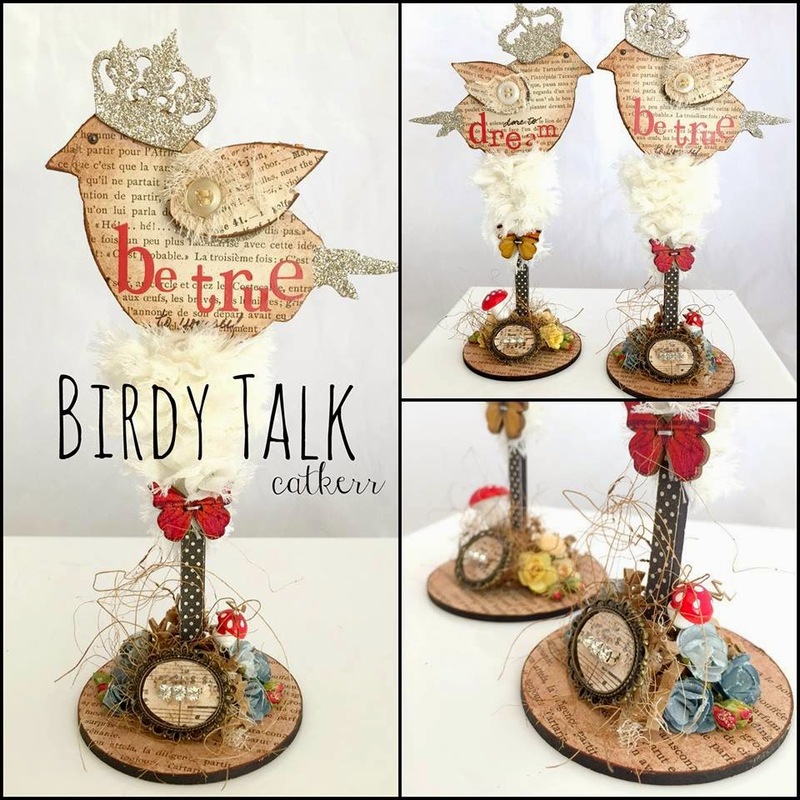 'Birdy Talk' by Design Team Member Cat Kerr is sure to put some "Spring" into your step! I'm especially loving the "plume" on the sweet Bird Stick! 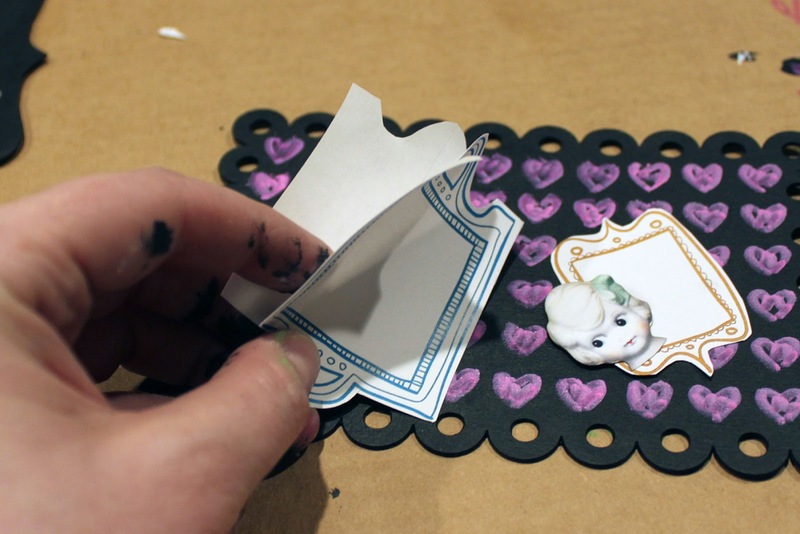 Hop on over to Cat's Blog for the full tutorial and tons of fun photos! Happy weekend everyone! I'm absolutely IN LOVE with our new goodies this week. So many of them go beautifully together! And of course that's no accident folks. As I added goodies, and designed more, they all evolved around this week's project below! As a big fan of our Stick Stand Ups, I had to design some Minis too, which are so adorable! Art Time! This week's project was loads of fun. I had the whole thing planned in my head before I started, and was so happy with the way it turned out! I don't always have a plan. Sometimes I just wing it, and that's okay too! Maybe you can tell I'm a HUGE Game of Thrones fan as well as a Downton Abbey fan. I think this piece is a great combination of the two! I started by laying out my supplies. I had a plan after all! 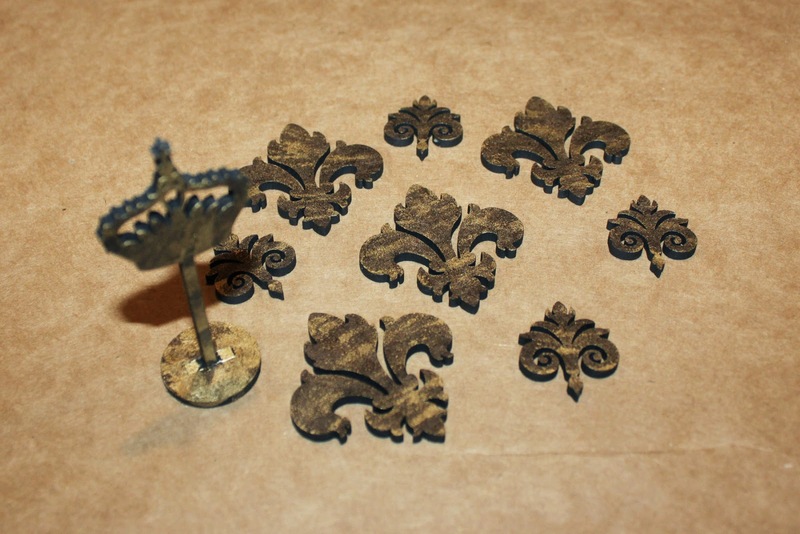 I lightly painted the Fleurs and Crown with gold acrylic paint, sponging it on with my foam brush. I let much of the Masonite show through. The pieces looked almost like gold leaf. I wanted a nice contrast with my light collage images. 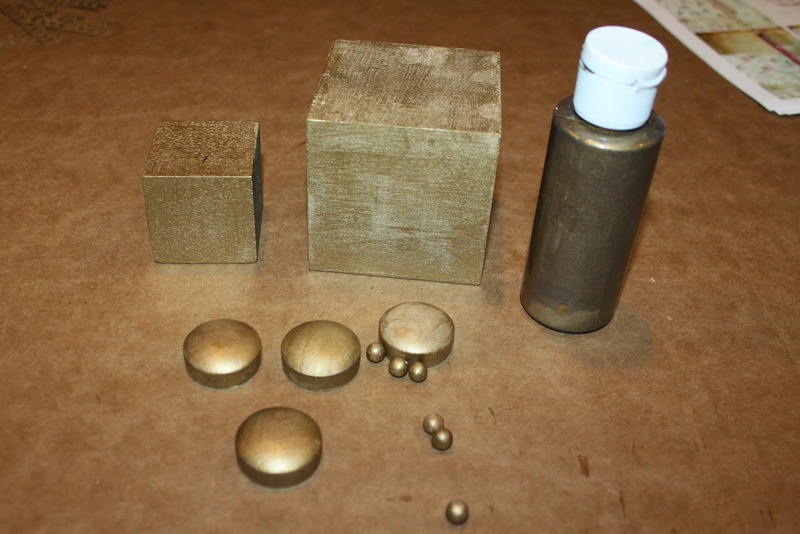 My other pieces were painted with two coats of gold acrylic paint. The main reason I painted my blocks, was because I planned to tear my collage images a bit smaller to created a nice border. If you plan to cover your entire block, painting isn't necessary. The ATC images work great for the 2.5" block since they are the same width. TIP: Use the edge of your block to crease the image, and then tear! Of course scissors work nicely too :). I attached my torn images using Mod Podge and filed any edges as needed. 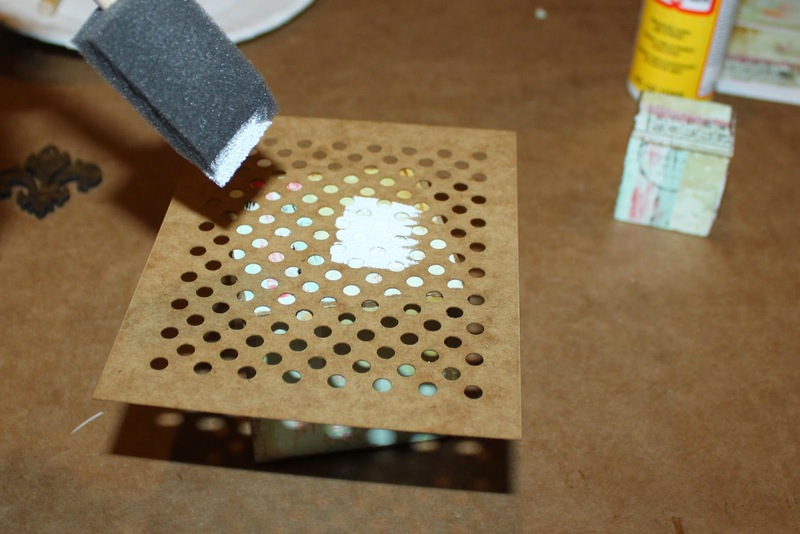 I randomly stenciled some dots with white acrylic paint. 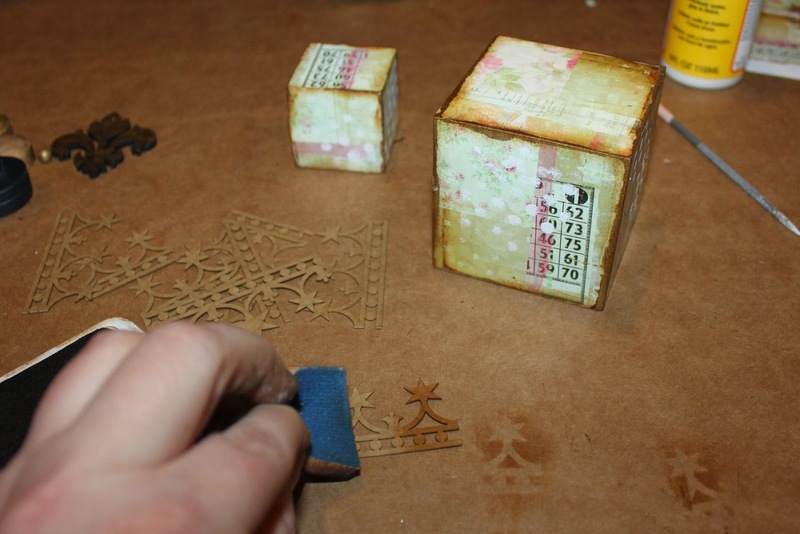 I added some ink to the edges of my blocks and colored the Stencil Board Borders with the ink as well. 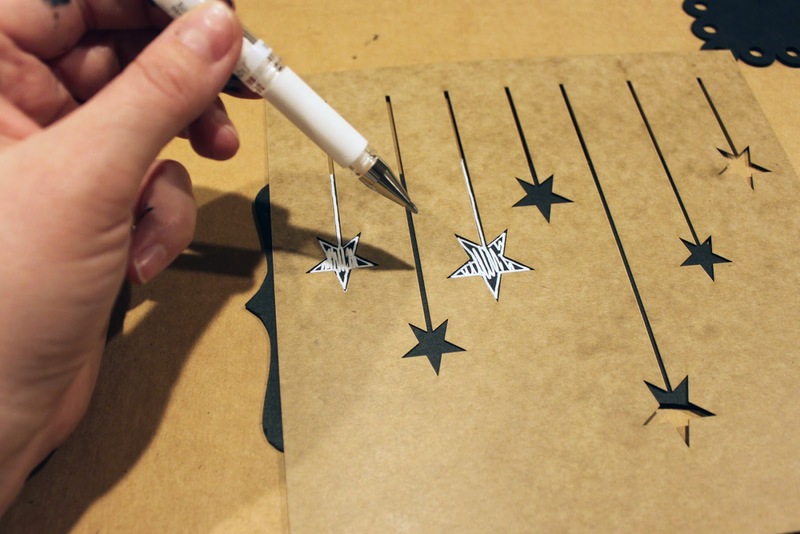 I inked the stars a bit darker, giving them a few extra swipes. 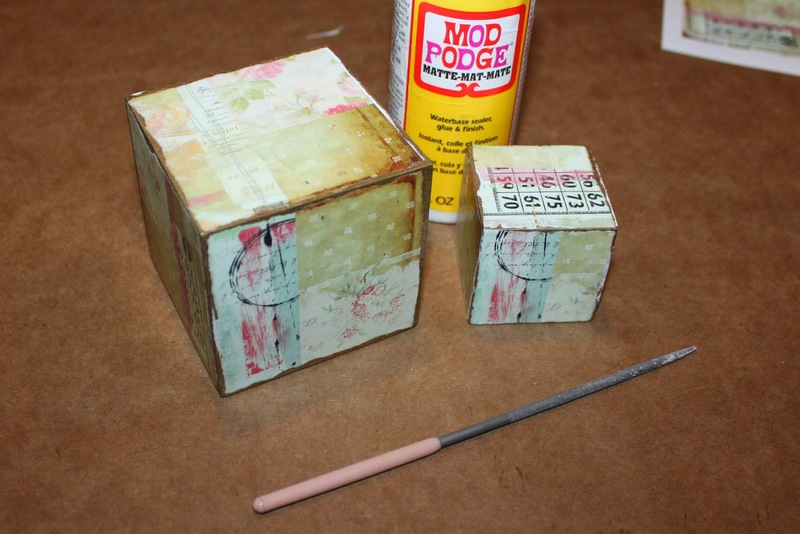 Finally, I assembled all of the pieces using Mod Podge! Oh yeah! I'm definitely loving this piece! It only took about an hour from start to finish, but looks more complicated (I think). 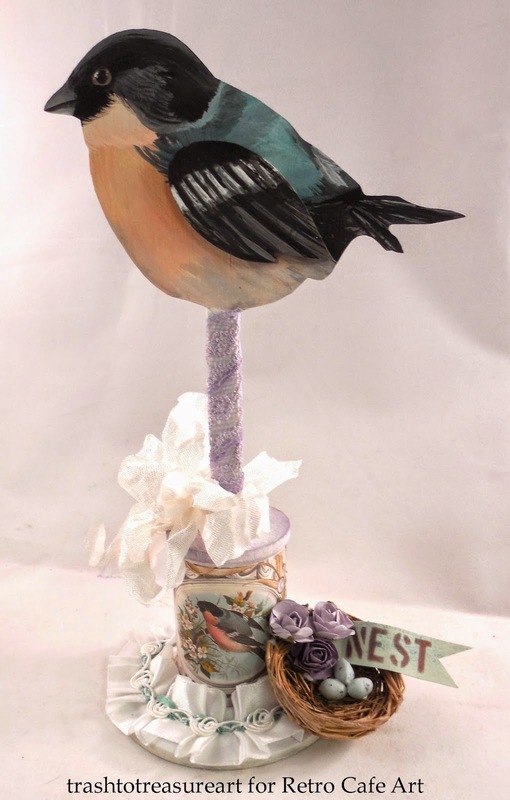 Spring is almost here (just 6 more days), so let's celebrate with this stunning Bird Stick Stand Up by Design Team Member Lynn Stevens! Absolutely incredible painting Lynn! Also, notice how the painted bird matches the collage image near the base. Brilliant! 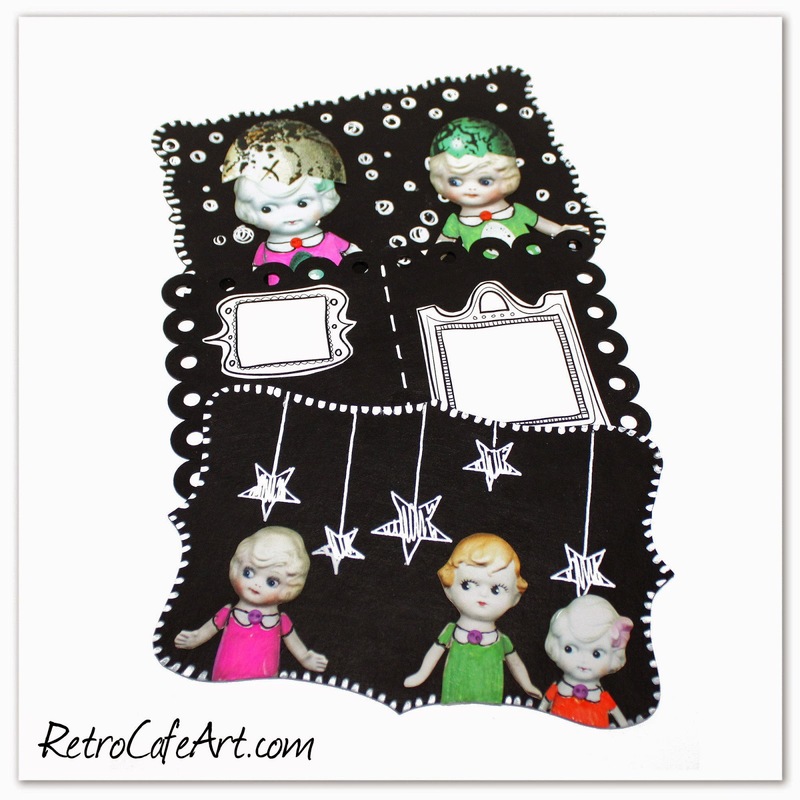 How cute are these Primitive Angel Dolls by Design Team Member Gerri Herbst! The happy colors just scream Spring! So sweet Gerri! 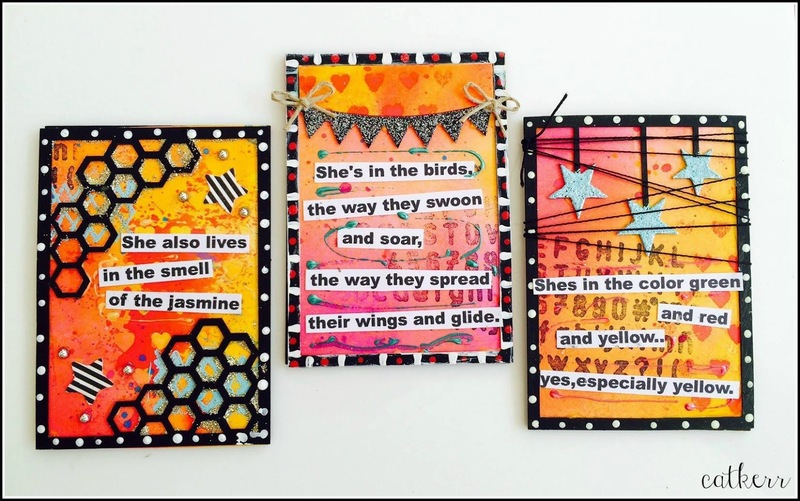 Beautiful, Bright, Happy ATCs by Design Team Member Cat Kerr! 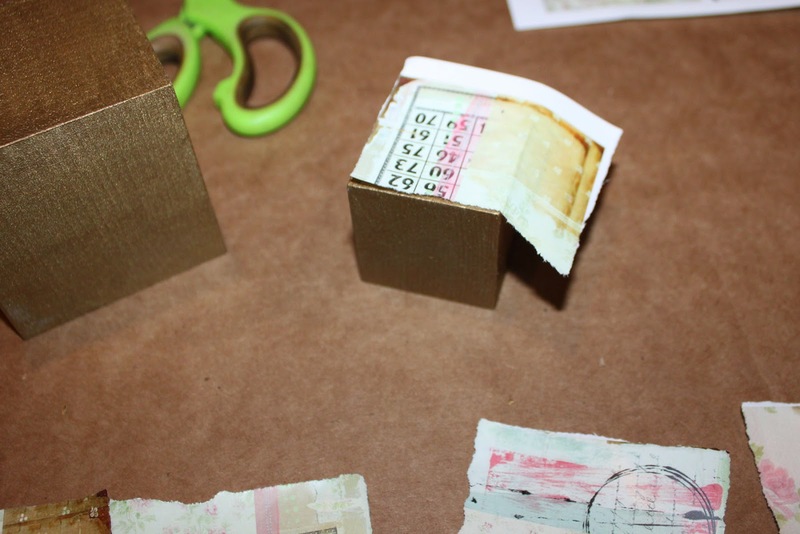 Especially loving the string and twine bits that were added to the ATC Frames. And of course the glitter. Great texture Cat! 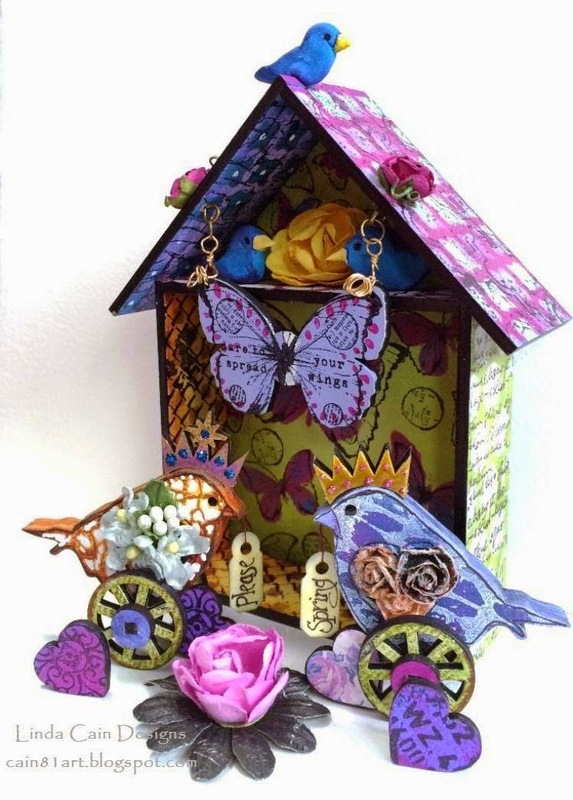 An incredible tiny village by Design Team Member Linda Cain! How cool are her little houses! Yeah! I'm loving Linda's bright happy colors too! Hop on over to Linda's blog for the full scoop! Happy weekend everyone! 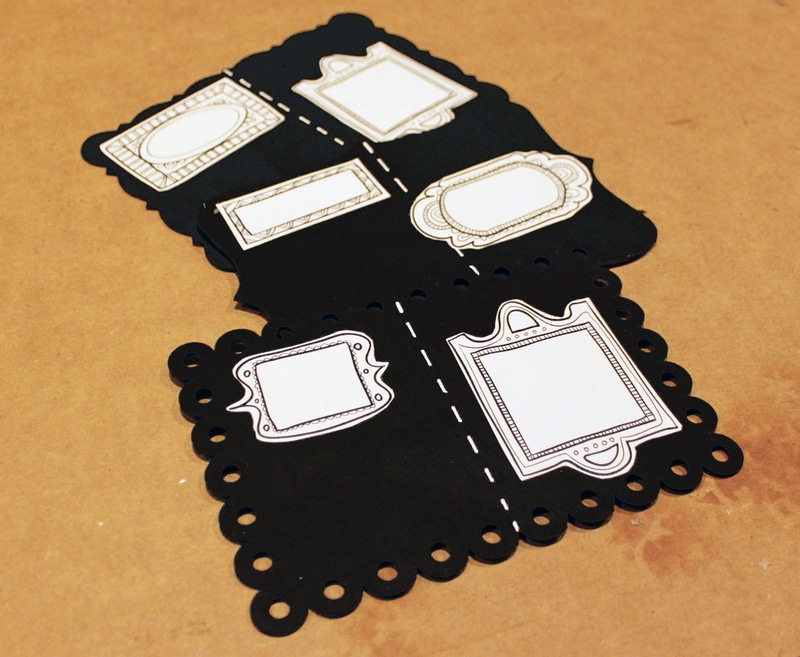 I was so in love with last week's Ornate Victorian Frame Stand Ups that I had to design a few more! 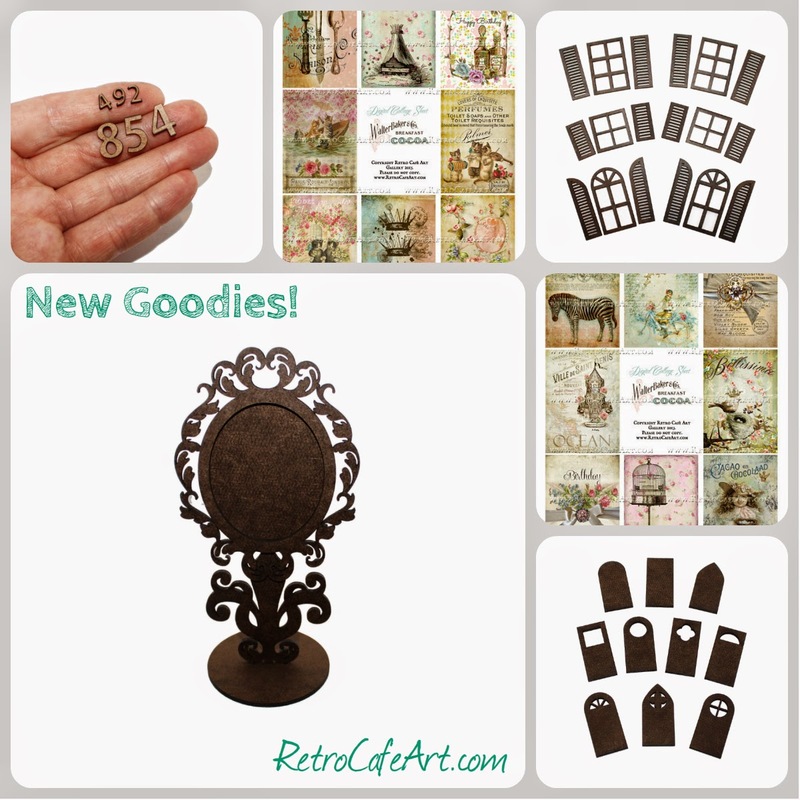 We also have awesome new Window and Door Cut Outs (great for SO many projects), brand new Collage Sheets, brand new Tim Holtz, and more! 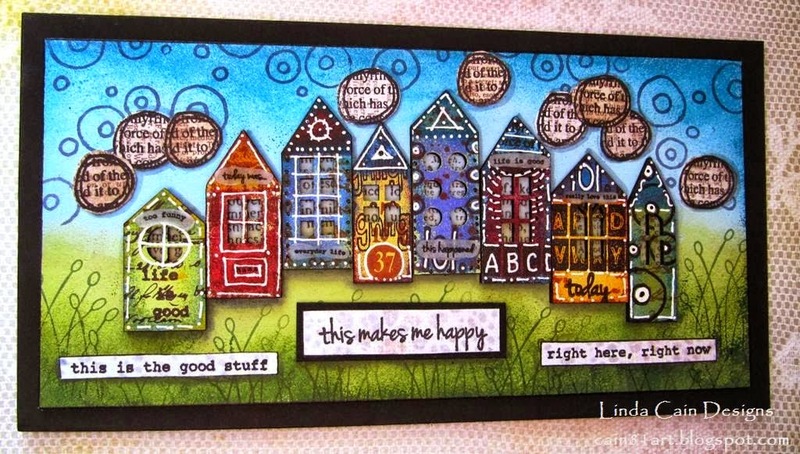 Design Team Member Linda Cain has an amazing project for you this week! Hop on over to Linda's blog for incredible photos and step-outs! Aren't her photos delicious? Check out Linda's post for more! 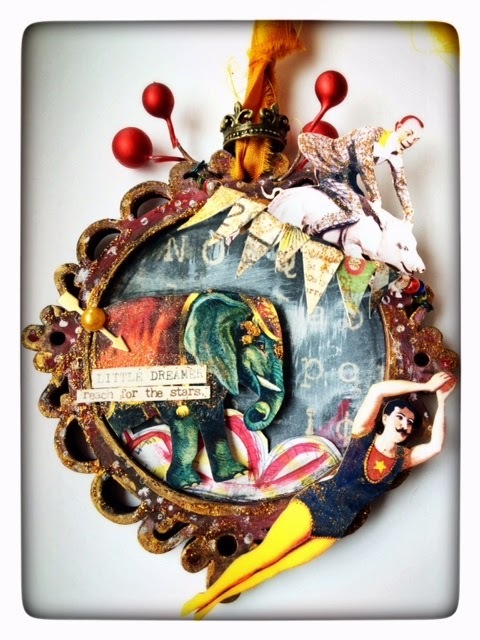 A gorgeous colorful and playful circus ornament assemblage by Design Team Member Amy Nieman! The movement in this piece is just awesome. So lovely Amy! 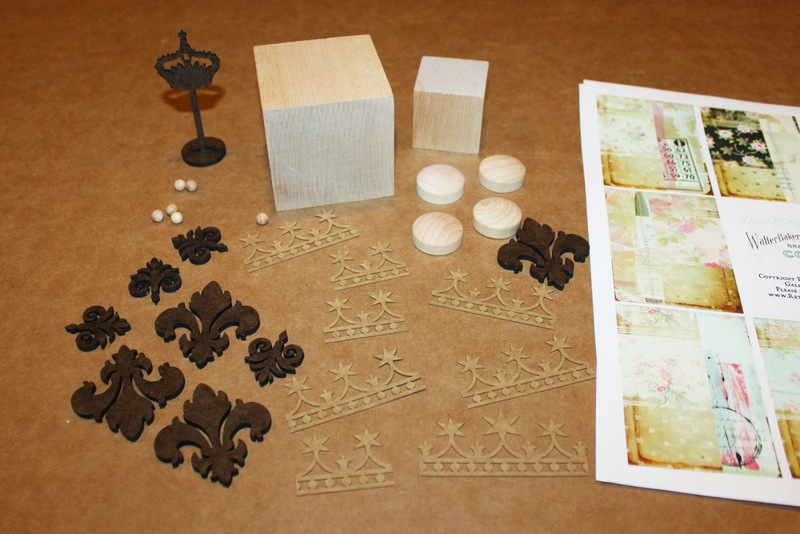 Design Team Member Lynn Stevens has been playing with the NEW Finnabair goodies! 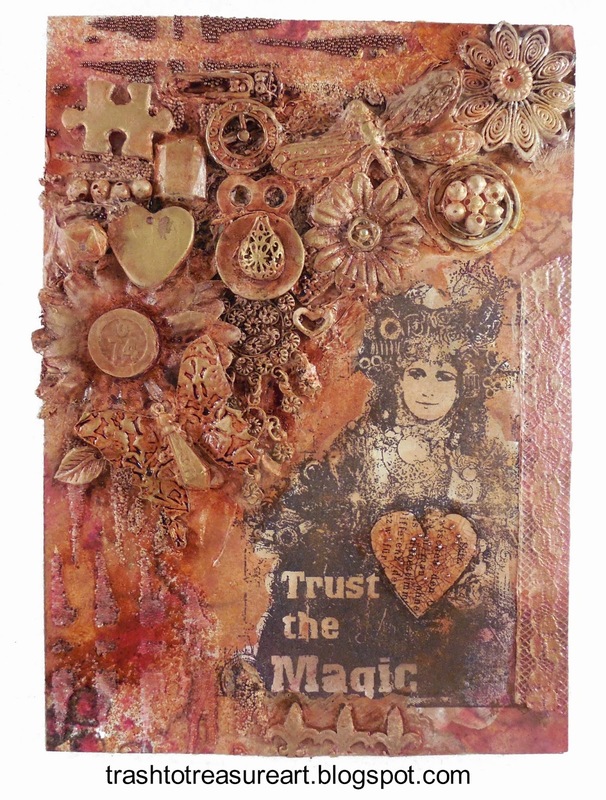 Her altered book cover is just stunning. I'm loving the way she used the Trust the Magic stamp. Fabulous Lynn! P.S. you can leave a comment on Lynn's blog for a chance to WIN this gorgeous piece HERE. An incredibly beautiful Dress Form Doll by Linda O'Connor! We're especially loving the little window on her chest! So beautiful Linda! 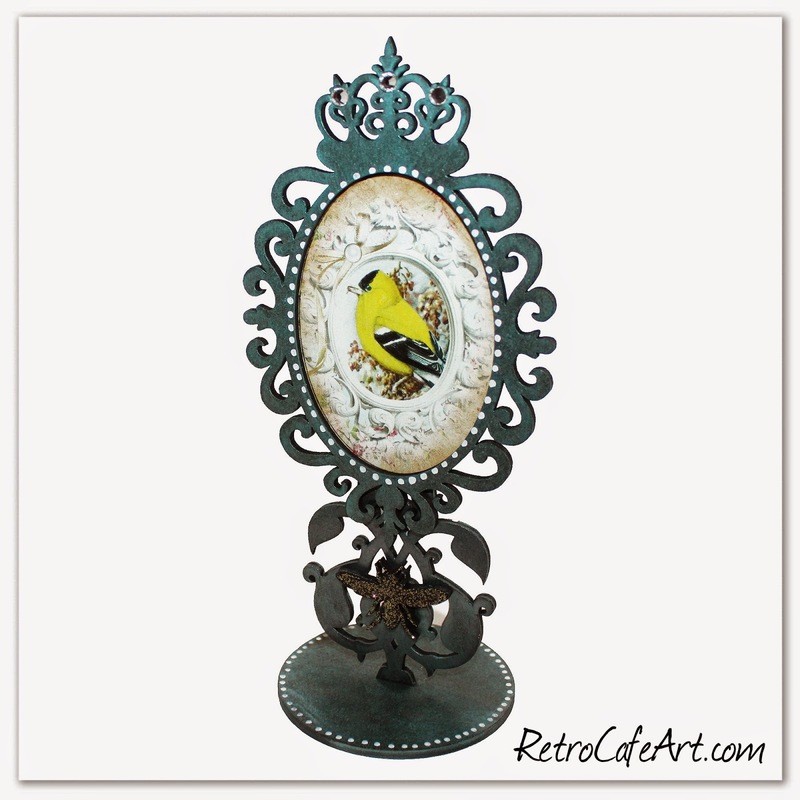 This week we have two new Ornate Victorian Frame Stand-Ups! Check out last week's tutorial HERE for some inspiration!